Buying an indoor or outdoor security camera with audio is a wise choice, if you want video and audio recording or if you need two-way audio communications to talk with your family/pets while you are away. Keep reading and you’ll on the right path to locate the best security cameras with audio tailored to your needs. Security cameras with a built-in microphone: This is the most common type of indoor and outdoor security cameras with audio that can record both videos and sound as well, such as the Reolink outdoor PoE security camera Reolink RLC-410. 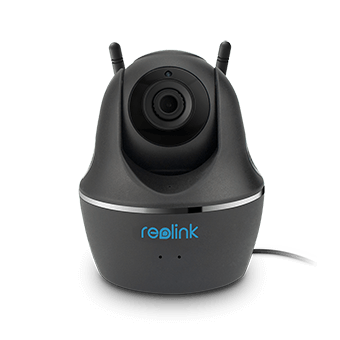 Security cameras that support an external microphone: Such type of security camera with audio recording comes with an audio-input connector, to which you can add an external microphone for video and audio recording, like the Reolink PTZ outdoor security camera Reolink RLC-423. Security cameras with two-way audio: The last but also widely-used kind is the security cameras with built-in microphone and speaker, through which you can listen to and talk with the visitors at your front door or your family without the need to physically be there. Taking the WiFi security camera with two-way audio Reolink Argus® 2 for example, this video below displays how you can take full advantage of the two-way audio feature. When a mailman comes to your front door, you will receive instant push notifications from your security camera with two-way audio. Then you can log into the app and watch the live stream of your front porch, telling the mailman to leave your package at the door. When selecting security cameras with audio, firstly you should know which type (recommended above) fits you most. And then you can take the following factors into consideration to make your final decision. The resolution of a good security camera with audio should be at least 1080p or 1440p (4-magepixel). It will enable you to see live videos in sharper and clearer images. An HD security camera with audio can also increase the chance for you to identify the face of a suspect and the license plate numbers, especially when the video footage is needed as the evidence to lodge claims. The wired and wireless security cameras with audio should at least have IR LEDs and IR filters to guarantee high quality night vision. The night vision distance of the security cameras with audio for home is also a factor you should check out, which signifies how far the cameras can see even in total darkness. Some high-end wireless security cameras with audio, like Reolink Argus® 2, can also deliver true color images at night to give you more vivid details (click here to learn more about color night vision security cameras). Below is the color night vision video captured by the outdoor security camera with audio, Reolink Argus® 2. For the indoor security cameras with audio, they are designed “not waterproof” and are commonly used inside your home and offices. While the outdoor security cameras with audio are ideal to be placed both inside and outside. Waterproof is the NO.1 feature for a wireless outdoor security camera with audio. 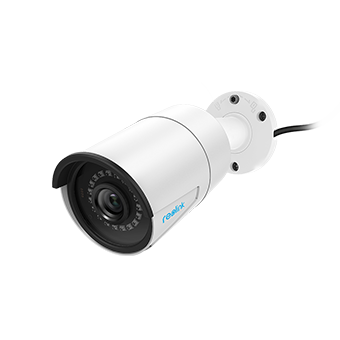 An IP65 or IP66 outdoor security camera with two-way audio is capable to brave all the elements. If you want to know if a wired or wireless security camera with audio can tolerate extreme cold or heat, check out the camera working temperature in the product specifications. The Reolink Argus® 2 outdoor security camera with audio stands firmly in the heavy snow. It is capable to withstand various harsh weather conditions, including freezing cold and extreme heat, providing you with peace of mind day and night. Though many security cameras are advertised to feature audio recording, not all of them possess excellent audio quality to your expectations. To quickly find the best security cameras with audio, you may look through the user reviews of the security camera systems with audio to see if there are any complaints about the microphone sensitivity or the sound noise. And, it’s much better if there are video samples of security cameras with audio recording (like the video of Reolink Argus® 2 above), so that you can directly tell the audio quality of the cameras. When searching around the security cameras (systems) with audio, you should also pay attention to whether the brand is reliable enough. This will determine if the home security cameras with audio are of high quality and if you have warranty or not. Here are the key factors of a trusted brand. 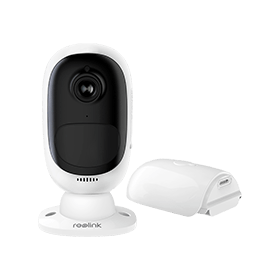 Reolink, for example, with a customer base of more than 2,000,000+ families from 200+ countries & regions worldwide, offers a wide range of high-quality wired and wireless security camera with audio. It also offers 2-year limited warranty, 30-day money back guarantee and 1-to-1 online support, eliminating all your concerns about after-sales service. After a thorough comparison of multiple top-rated security cameras with audio, here we’ve picked up 4 best indoor and outdoor security cameras (systems) with audio. The indoor wireless security camera with two-way audio Reolink C1 Pro is one of the most popular home security cameras this year. It allows you to see real-time videos in Full HD on your mobile phones or tablets, and to communicate with the ones around the camera. For parents, you can use this indoor security camera with audio as a baby monitor to check if your kids are safe back from school, and talk with them while you are in your office room. For pet owners, you can take it as a pet security camera with two-way audio. Checking what the dog is up to and letting the pet hear your voice (saying hi from work) are really cool things to both you and the pet. Even though you leave your four-legged family member home, you can get long peace of mind. Below is a night vision video shared by a user of this indoor security camera with audio. As a wireless security camera with two-way audio, Reolink Argus® 2 makes it an easy task for you to listen to and talk with your loved ones from thousands of miles away. When motion movement is detected, you can login to the app to watch the live viewing and scare away the potential burglars with the audio function. Better yet, this wireless security camera also comes with the audio alarm (siren), which also serve as a powerful deterrent against bandits. Boasting 100% wire-free, this rechargeable battery powered outdoor security camera with audio requires no wires and no drilling holes – super easy to install even you’re a tech layman. Below is a video shared by a user of the WiFi security camera with audio Reolink Argus® 2. If you are looking for the best-value security cameras with audio recording that can get the job done, Reolink RLC-410 should absolutely top your wish list. Featured with a built-in microphone and IP66 waterproof rating, this outdoor security camera with audio is capable to record crystal clear videos (4MP & 5MP) as well as high quality sound with no noise. Watch the video below to check out the image quality of this wired security camera with audio. 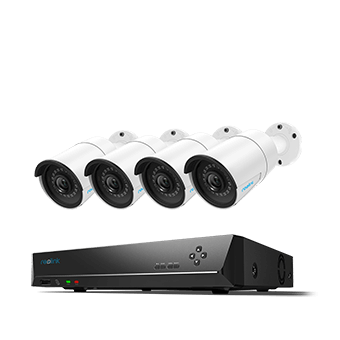 Or in case you need a security camera system with audio, take a look at this home security camera system with audio Reolink RLK8-410B4, which consists of 4 Reolink RLC-410 cameras and an NVR for video storage. Before you employ a security camera with audio for your application, don’t forget to check the audio recording laws in your state. Video only recording without permission is regarded as legal in most cases, as long as you don’t invade the privacy of the person you’re recording. But the usage of wired and wireless security cameras with audio is subject to stricter laws and regulations. For example, using hidden security cameras with audio is almost always illegal in most states. Normally at least one-party consent is required for audio recording. And one universal rule you should obey is that, you can’t install security cameras with audio recording in places where privacy is expected, such as the bathrooms, bedrooms, toilets, dressing rooms, etc. To make sure the home security cameras with audio is legal in your place, you may research the related laws and regulations (local & state) online and consult an attorney for double insurance. Don’t worry, though, if you want to disable the audio recording function. 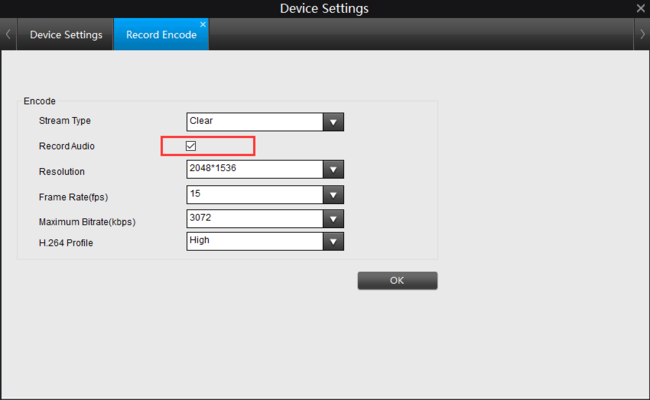 Taking the indoor wireless security camera with audio Reolink C1 Pro as example, you simply need to log into the Reolink Client, go to the “Device Settings” > “Record Encode” and untick the box before “Record Audio” (shown as the picture below). If you have any more questions about the security cameras with audio, please leave your comment below and I’ll reply to you as soon as I can. This entry was posted in Buyer's Guide and tagged audio recording, built-in mic, legality, security cameras, speaker. I have 3 RLC-420s. Initially the audio was working on all of them but has stopped on one. The video still works fine. Should I send it back for a replacement? Hi Boe. Please make sure all the audio settings are correctly set up (log into Reolink Client on your PC, go to the Device Settings page and make sure the “Record audio” option has been ticked). Another probable cause is that you view the video on your phone and do not turn on the audio option on your phone with media. Asking the tech support team to have a check on the product is a recommended way if you want overall troubleshooting. Hope these help. I don’t yet own a Reolink product but boy, do they read/sound like what I am looking for, especially the Reolink RLC-410 boasting great night vision, waterproofness, audio recording,true color mages, IR L.E.D.s & filters, motion detection, siren, push notifications, etc. Is this product available for sale in MN in stores, and if so which ones ? Is there a 1-800# I can call ?? Hi, Jeff, yes, RLC-410 is one of our top sellers that comes with multiple useful features. You can check here /product/rlc-410/ for more information. We currently don’t have oversea stores in MN yet. You may place your order on our official website and enjoy free shipping as well as 2-year limited warranty.